This photo shows part of the set up our crew did to clean up after a house fire in the Green Bay area. You can see there are plastic sheets hanging to keep soot and smoke particles from spreading to unaffected areas of the house. This is another photo of the fire damage to a fireplace at a home in the Green Bay area. This is a close-up shot of the soot the flames left behind on the bricks. 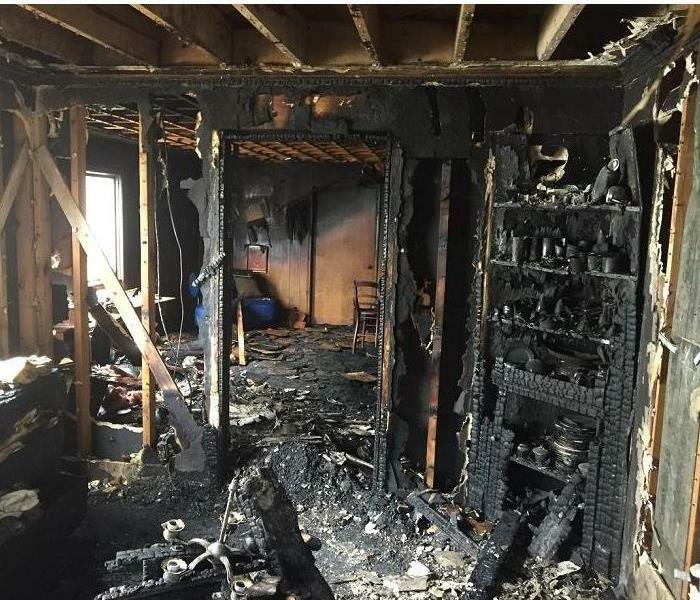 If you need help with cleanup following a fire, call SERVPRO of East Brown County at 920-499-7050. You can see fire damage on this fireplace at a home in the Green Bay area. It was not the fireplace that actually caused the blaze, but the flames left their mark on the bricks. Team SERVPRO of East Brown County helped provide cleanup in the aftermath. This photo shows wet carpeting from a water loss in the Green Bay area. A member of Team SERVPRO of East Brown County has pulled the carpet back to show the flooring underneath, which is also wet. This flooding was caused by a burst pipe. 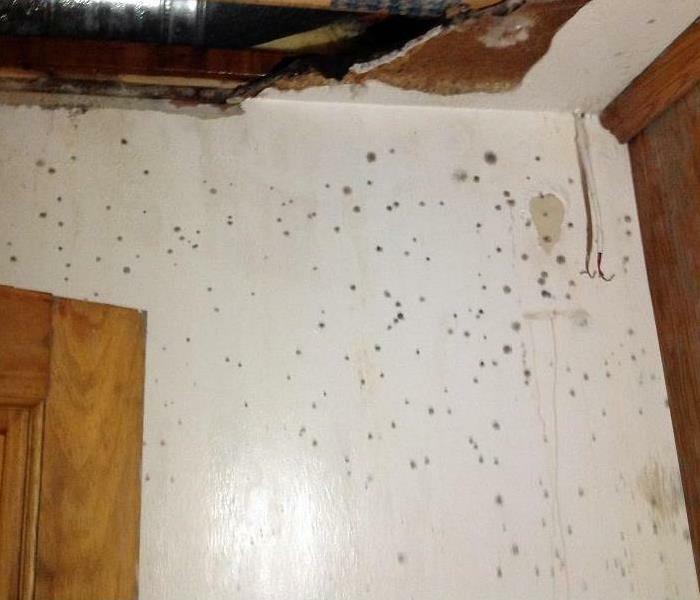 This picture gives a very clear understanding of what successful mold remediation looks like. Our techs took this photo after cleaning one half of the affected area and leaving the other half alone. (Of course they cleaned the entire area after the photo was taken!) This shows our team's ability to do mold remediation cleanup right. If you need SERVPRO of East Brown County for help with mold in the Green Bay area, call us any time at 920-499-7050. This is a good example of a drying set up at a water loss in the Green Bay area. When a home experiences some kind of flooding, that often results in a flooded basement. Along with flooding, our technicians will often find mold growth as well. That means the techs will need to dry the water and provide mold remediation. 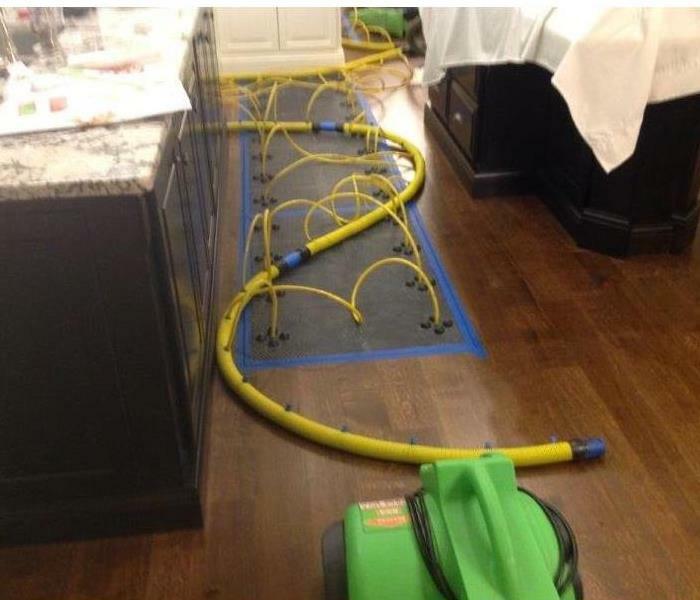 This photo shows fans set up to dry the floor and walls, and a plastic containment "wall" set up to keep any mold spores contained to the affected area so they don't spread to the rest of the house. This is the aftermath of a fire in the Green Bay area. You can see there was significant damage to the building materials in the ceiling. Much of that material, like insulation, had to be ripped out. Underneath those materials you can see there was soot and smoke damage that got deep into the ceiling. Our team is able to clean up any remaining fire damage like smoke and soot, as well as any remaining odors in the air. We are also able to help rebuild after that recovery process. This photo shows our team pulling up carpet padding that was damaged by flooding in the Green Bay area. When carpet experiences water damage, most times the padding underneath needs to be removed because of that damage and the risk of pathogens growing in the pad. Our SERVPRO team will pull back the carpeting, remove the pad, throw the pad away and put the carpeting back. In most cases the carpet can be saved, but if it can't, our technicians will know what steps to take next. This photo shows what is called carpet delamination. This happens when the secondary backing on the carpet separates from the primary backing. This can happen when a carpeted area experiences flooding and/or high traffic. Delamination is a serious issue and means that the carpet needs to be completely removed. SERVPRO of East Brown County is on the lookout for this when we respond to water damage in the Green Bay area. 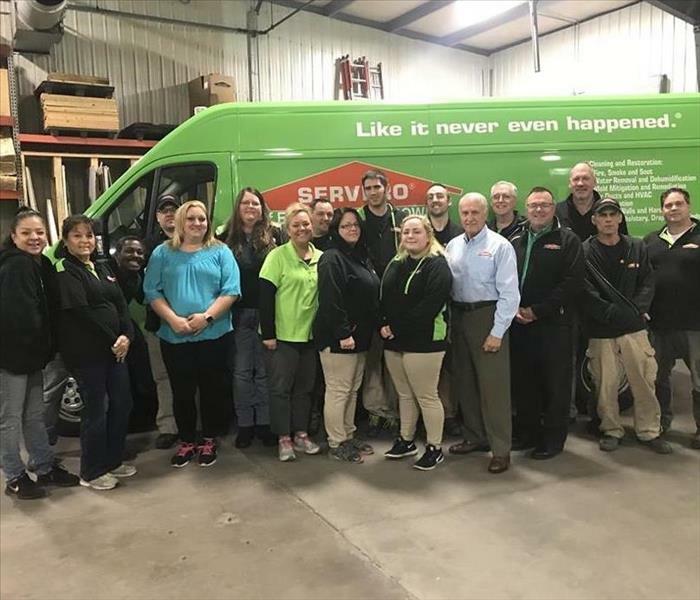 This is a current photo of team SERVPRO of East Brown County. A few smiling faces are missing, including Brandon, Scott, Georgia and Alex (who took the photo!). We're always rather busy, so it's tough to get everyone in the same place at once! 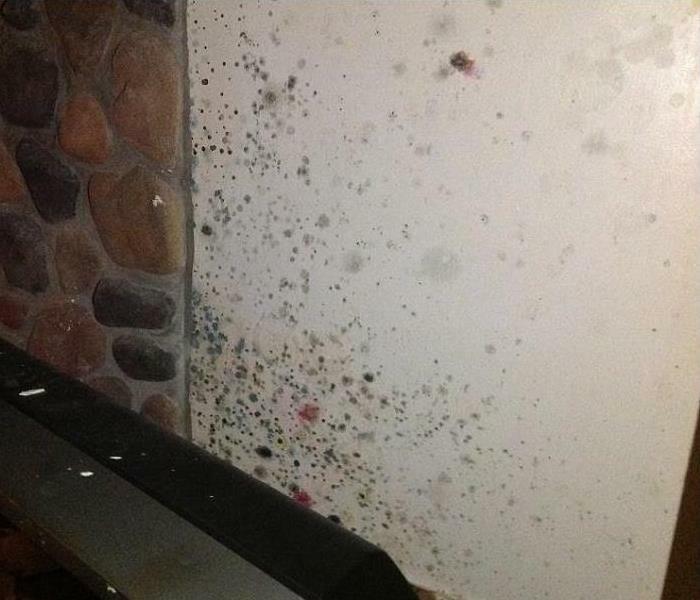 This photo shows mold growing behind the walls in a Green Bay area home. Our technicians removed some of the building materials to find the mold and properly remove it. 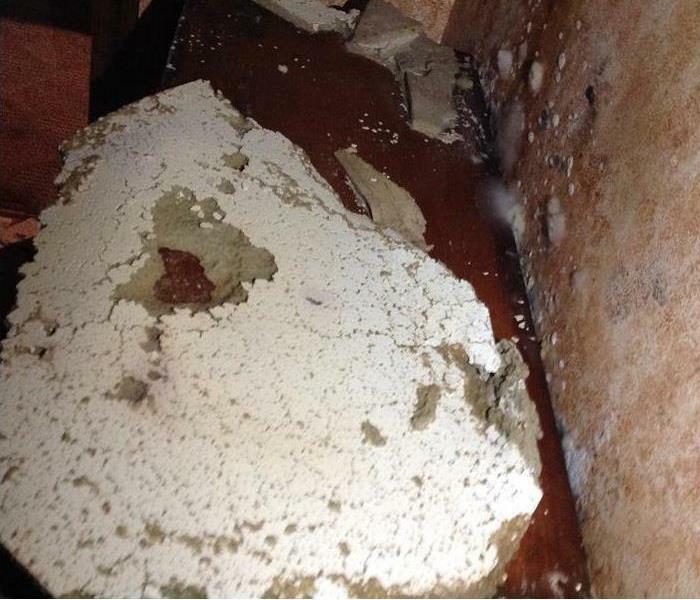 This photo shows why it's so important to have any water damage or mold growth taken care of professionally. If you do not, the damage on the surface might be taken care of, but only the professionals can find and take care of the damage hiding underneath. 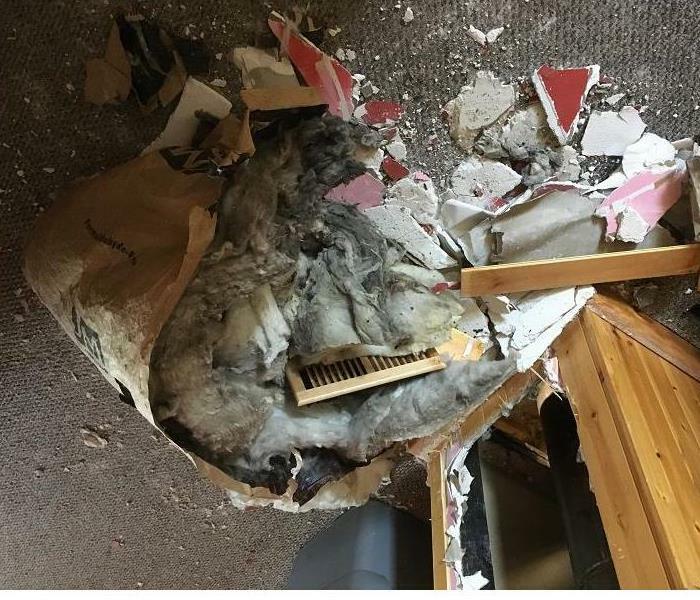 This photo shows what the insulation looks like from a home after a fire. You can see evidence of the smoke and soot that made its way into the walls, into the insulation itself. This illustrates just how pervasive fire damage can be and you can imagine the smell it leaves behind! SERVPRO of East Brown County is able to properly clean this kind of damage and remove any residual odors. 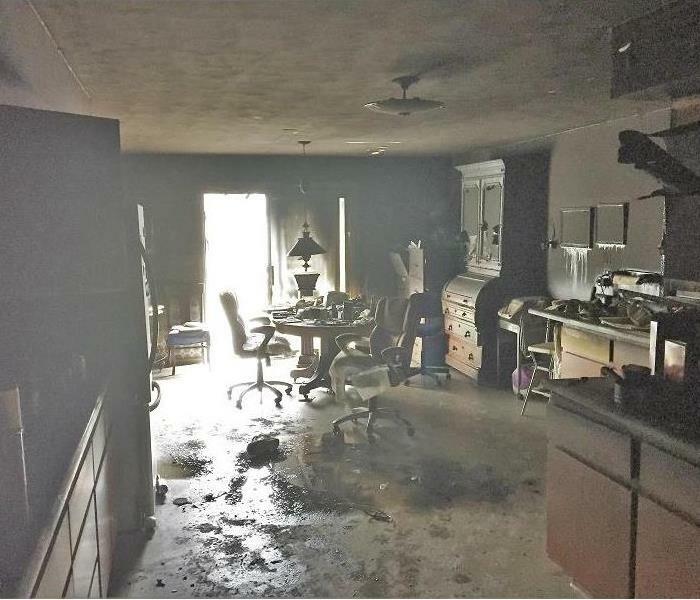 Oftentimes, when SERVPRO of East Brown County cleans up after fire, flood or mold, team members need to tear out damaged building materials and other non-salvageable items. Part of the job for the techs is to properly pick up, contain and throw away all of those materials. This photo shows some trash from a job site, ready to be taken to the dumb. This photo shows a Green Bay area home that experienced flooding. The water actually poured in through a window, leaving behind this standing water. We have a short video of the water pouring in through the window of in the video gallery here on our website if you would like to see it. A rare sighting! A fleet of our vehicles at a commercial water loss in the Green Bay area. The trucks certainly stand out and look lovely lined up like that. However, it's important to note, this shows just how important a prompt, effective response is to our team. If you have an emergency that requires all hands on deck, SERVPRO of East Brown County will be there for you. 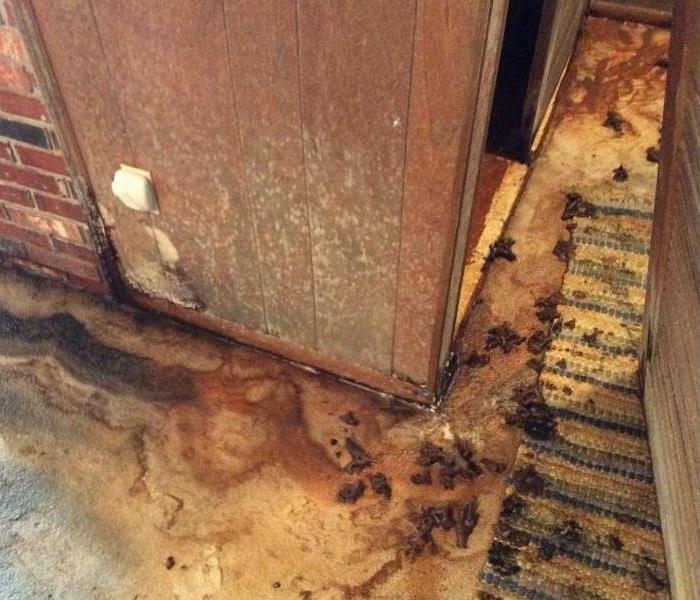 This photo shows the aftermath of a home that experienced flooding thanks to a broken refrigerator line. That water then sat for about a week. 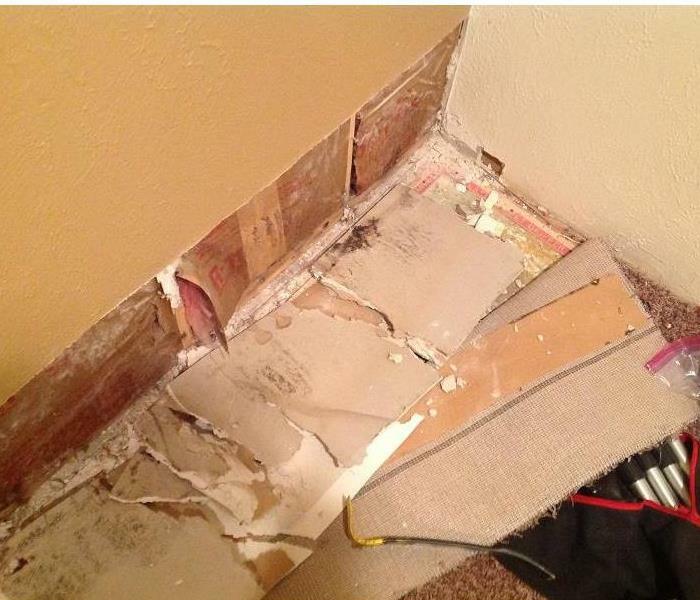 In this case our technicians needed to remove floorboards, baseboards, sheetrock and more materials to ensure they were able to properly dry the home. The drying process often leaves rooms looking like this. However, the next step is for our team to reconstruct! Team members will plan what needs to be done and put the home back in its original order. If this vehicle doesn't grab your attention, we don't know what will! Keep your eyes peeled for this car driving around Green Bay and all over Northeast Wisconsin. Our employee Jim Knopf is usually driving it. If you see Jim, say hello! SERVPRO of East Brown County is getting in on the kindness rocks/painted rocks craze! 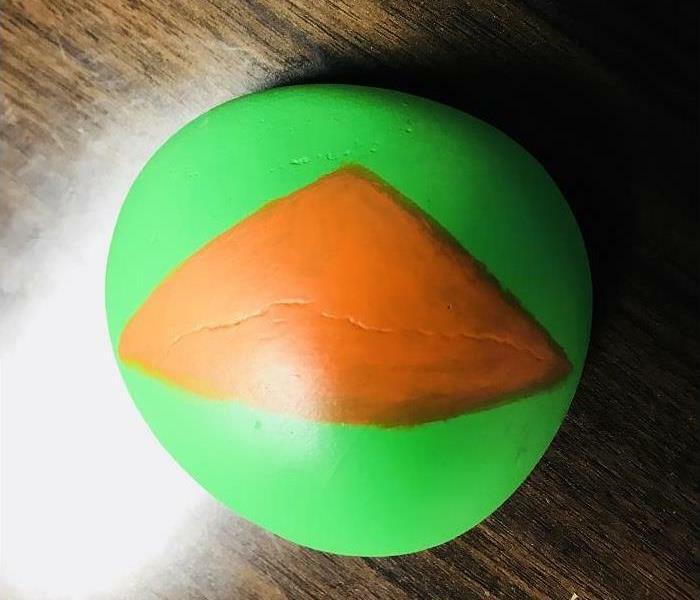 Our marketing folks will be placing these orange and green rocks around the Green Bay area. If you find one, post a photo on our social media pages! We hope these little guys brighten your day! This is a photo of Boo! Boo is the office dog and mascot for SERVPRO of East Brown County. Franchise owners Mike and Georgia Bogenschuetz own Boo and love him very much! While Boo is in the office a few days a week, this photo shows him on a break, after a bath! 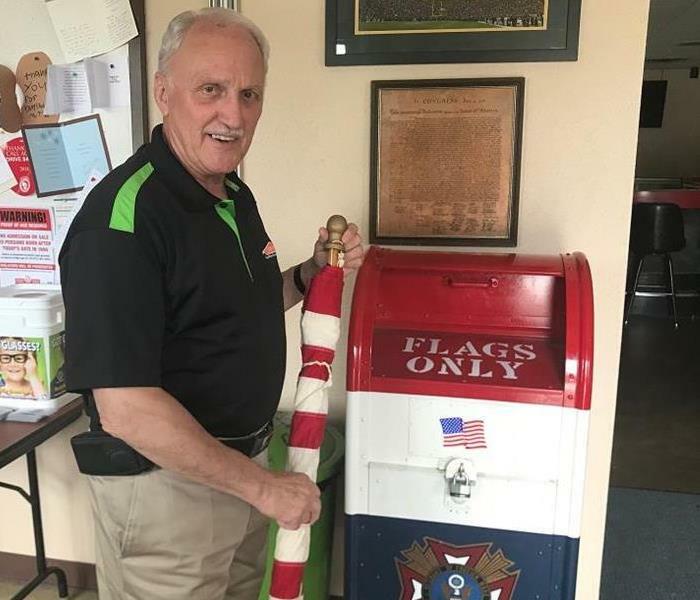 This photo shows Jim Knopf of SERVPRO East Brown County dropping off an American Flag for proper disposal at the local VFW Post. As a Vietnam Veteran, it's particularly important to Jim to ensure flags are disposed of respectfully. 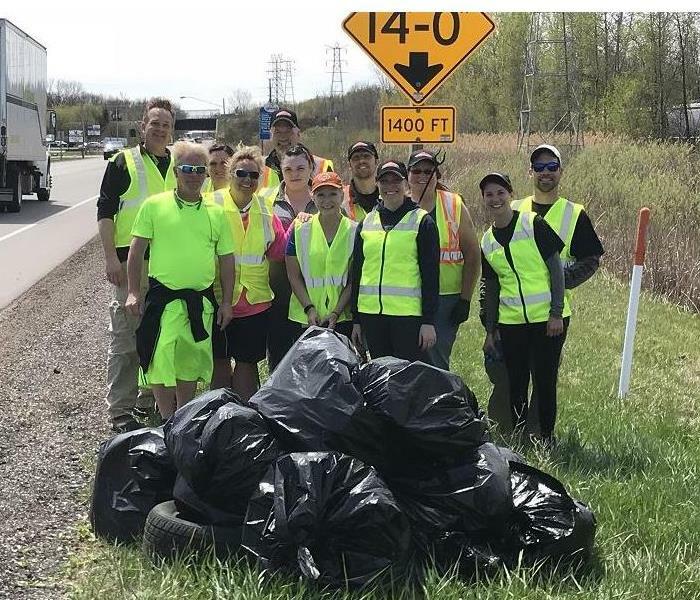 About 15 of our SERVPRO team members, along with a few friends and family, volunteered to do road clean up in the Village of Howard. We picked up about 40 bags of trash over about three hours of work. We like helping out in our community and working to keep our backyard a little cleaner and greener! This photo shows the aftermath of a serious water damage situation at a home in the Green Bay area. The home was unoccupied when the boiler broke, causing flooding and high humidity levels across many rooms. The situation was so bad that, in addition to the more typical mold, mushrooms were actually growing out of the floors. You can see the brown patches in this photo are mushrooms. SERVPRO of East Brown County helped mitigate and remediate the water damage, as well as the mold and mushrooms. The owners were able to rebuild. This photo shows the aftermath of a major house fire in the Green Bay area. SERVPRO of East Brown County was called in to clean up and rebuild the home. It took several months for our crews to rebuild, as the damage was so severe. It felt good, in the end, to have been able to help after such a devastating loss. 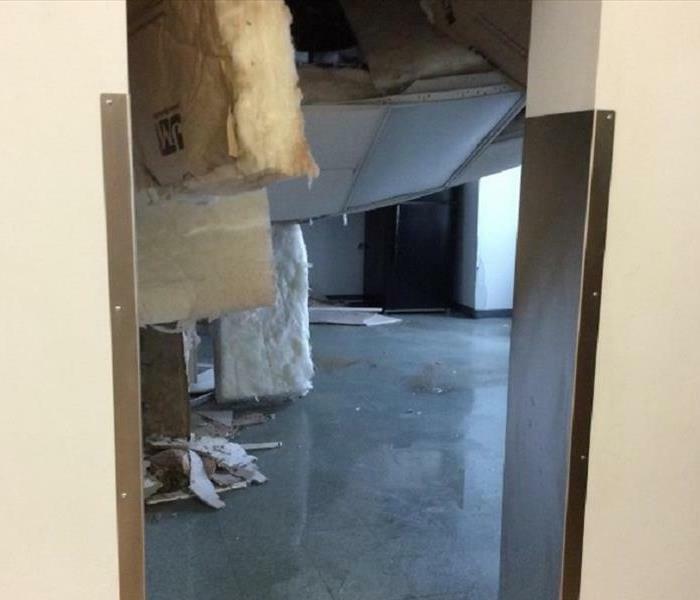 This is the hallway of a Green Bay area business that experienced flooding after a late-April blizzard. Several parts of the business and its office had water spill in thanks to a broken sprinkler head. SERVPRO of East Brown County came in to clean up the water, dry everything out and clear away any debris that was left behind. If you have issues with water damage, let us know! This photo shows work SERVPRO of East Brown County did after a winter storm caused a roof collapse and broken sprinkler at a Green Bay area business. Water covered the floors of the business, including the office space. Our crews removed the floorboards, dried everything and rebuilt the office in less than a week. This photo shows the aftermath of a commercial fire in the Green Bay area. To get inside the building firefighters had to tear down a large, overhead garage door. After the flames were out, SERVPRO of East Brown County came in, cleaned up the debris and boarded up the empty doorway to protect the building from the elements. Mold does not restrict itself to growing in areas that are easy to see or reach. Often it will grow in places like basements, attics and crawl spaces. This photo shows large colonies of mold growing in the eaves. Our SERVPRO teams are equipped and trained to remediate mold anywhere it grows to ensure your home or business is safe and clean. 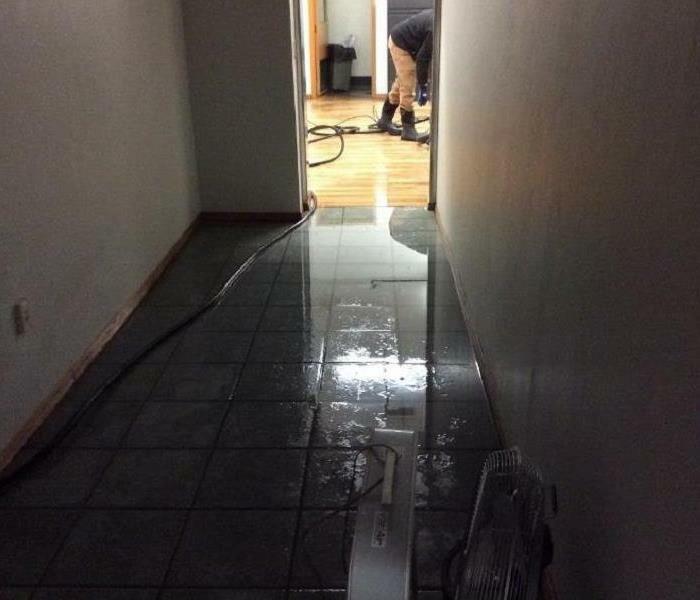 This photo shows the aftermath of a flooding incident at a Green Bay area hotel. The unwanted water reached the exercise room of the hotel. We made sure to start the drying process by protecting the workout equipment. 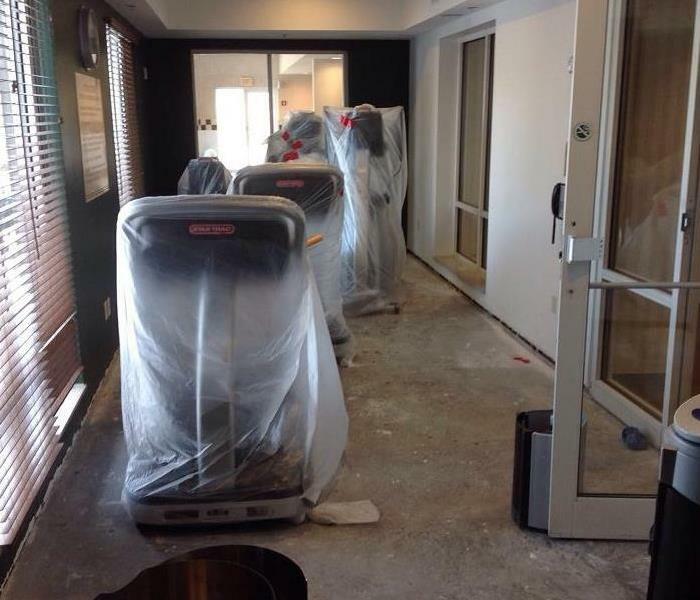 You can see the treadmills are covered in protective plastic wrap. That way we ensured as little water damage as possible to the equipment during the drying process. This is just one example of how SERVPRO takes care of your property as if it were our own. This photo is from a fire that happened at a commercial location in the Green Bay area on Easter Sunday. Firefighters had to break down a glass door to get inside and fight the blaze. SERVPRO of East Brown County came in afterward to board up the missing door. The roof collapsed on this business in Northeast Wisconsin thanks to a late spring blizzard that dumped two feet of snow across the area. The collapse also broke a sprinkler, which left the business covered in water. SERVPRO of East Brown County dried the water and cleaned up the mess. Mold doesn't just grow on walls. It can grow on a lot of different, wet surfaces. 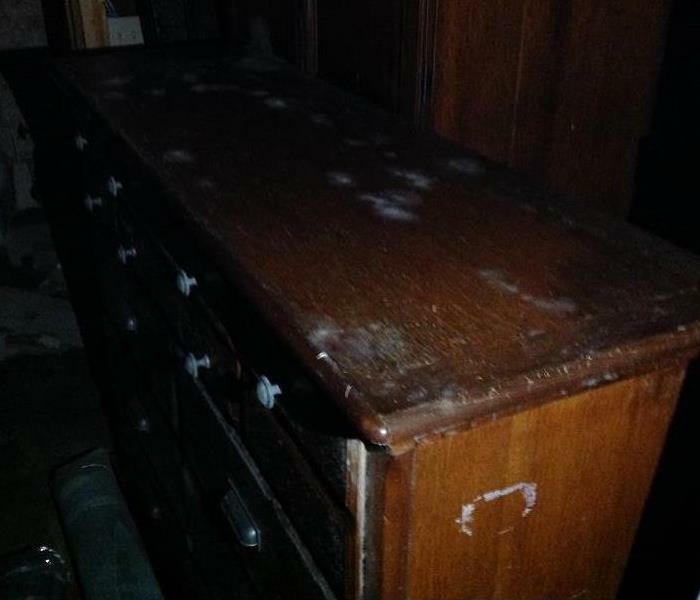 This shot shows the fungus growing on a piece of furniture in the Green Bay Area. SERVPRO of East Brown County can clean and disinfect any furniture or personal belongings that are still salvageable after a mold growth. 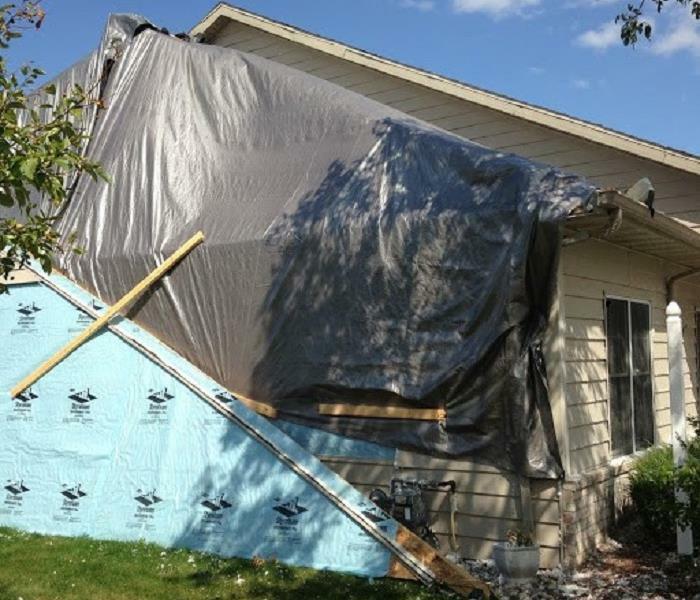 This is a photo of a home that was hit by major storms in Northeast Wisconsin. The top of one side of the house received massive damage. We were called in to reconstruct the home and clear away the debris. 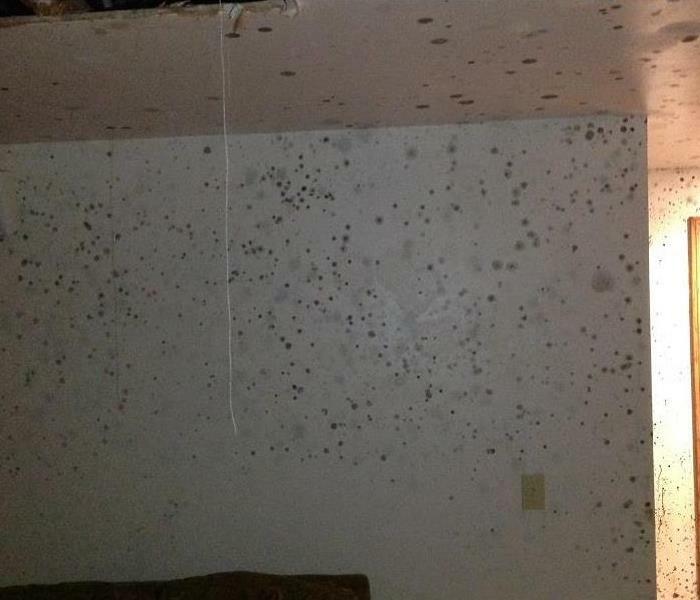 This photo shows the aftermath of a water leak in a Green Bay Area home. Once a leak happens the water leaves behind quite a mess. 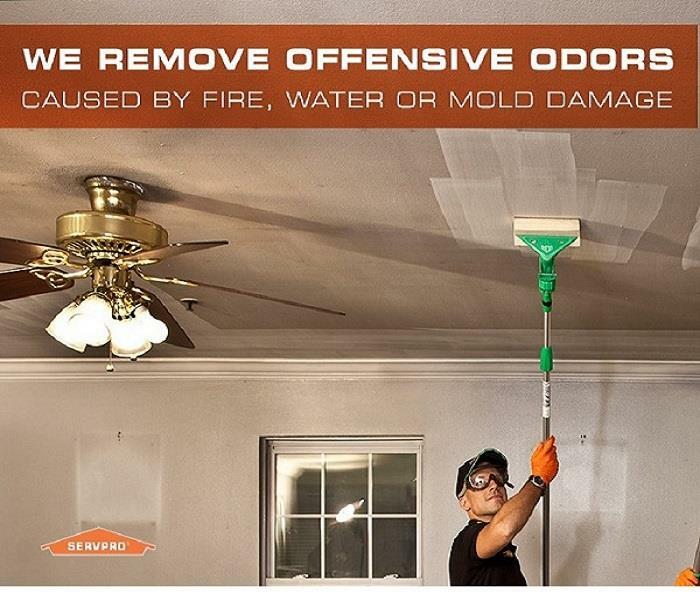 SERVPRO of East Brown County is able to clean up the mess and any damage that might come with it. 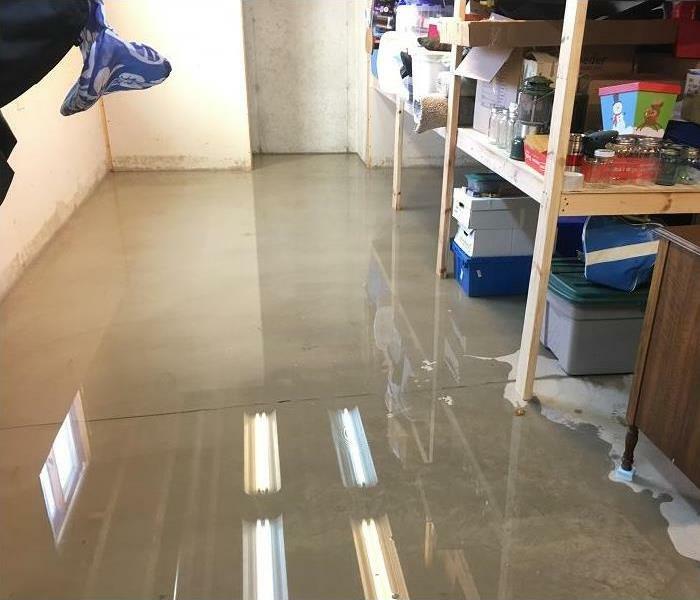 After a blizzard that left about two feet of snow all over Northeast Wisconsin, SERVPRO of East Brown County had several clients call us because their sump pumps failed. This is a common problem following storms of all kinds. 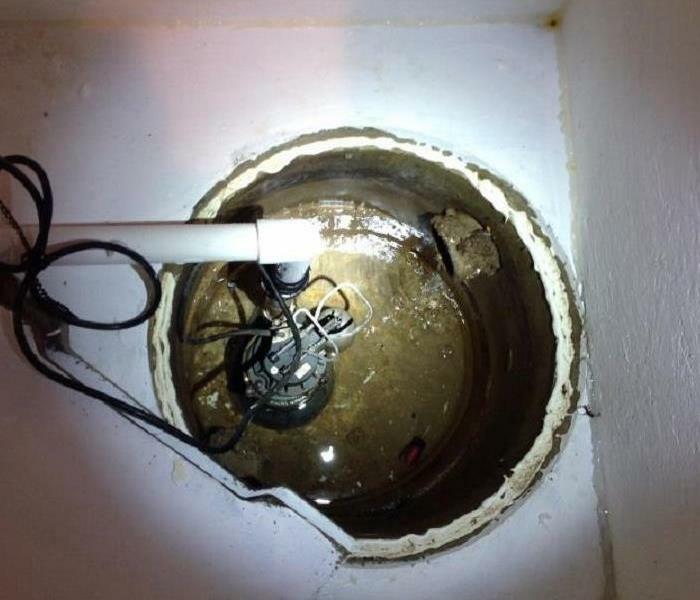 The photo serves as a good reminder to check your sump pump every so often to ensure it's working properly! This photo shows a typical mold remediation containment set up. SERVPRO techs will set up negative air chambers and air scrubbers to keep mold spores from traveling to other areas of a building while they perform cleanup. This was our techs can ensure the air stays as safe as possible during the remediation process. Disaster doesn't need to strike for SERVPRO teams to be helpful. We're available for typical office cleaning if your business needs sprucing up. A flooded office like this is not good for business. People are unable to work in an environment like this We're here to help get everyone back to work as quickly as possible. Often when there is a fire, firefighters need to use a lot of water to put out the flames. This can result in water damage on top of fire damage to a property. We at SERVPRO of East Brown County are able to help you recover from both. Mold is a tricky fungus that likes to grow on wet surfaces. And in some cases it can grow fast, covering walls in as little as 24 to 72 hours. If you suspect you have a mold problem, call us ASAP! As mold grows, sometimes you can see it plainly on walls and ceilings. However, SOMETIMES, the mold grows in hidden places BEHIND the walls and under carpets. You can usually smell a musty odor with mold. If you suspect you have it, give us a call! Unwanted water poses many dangers. Depending on what happens and how long the water sits, it can cause structural damage. That can mean issues like warped or ruined ceilings and drywall. 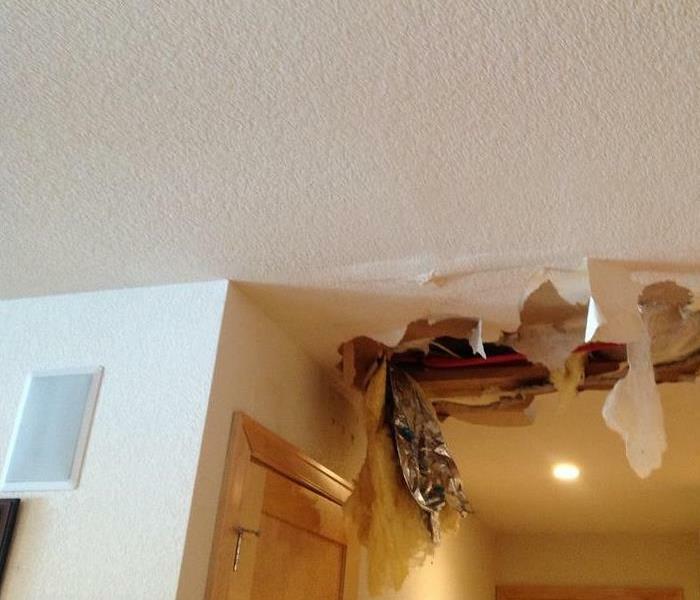 This photo is from a Green Bay area home that experienced a pipe leak in the ceiling of a finished basement. When unwanted water strikes, like from a flood or leaking pipes, it can cause structural damage. This is some debris from a site we're helping clean up after such an incident. 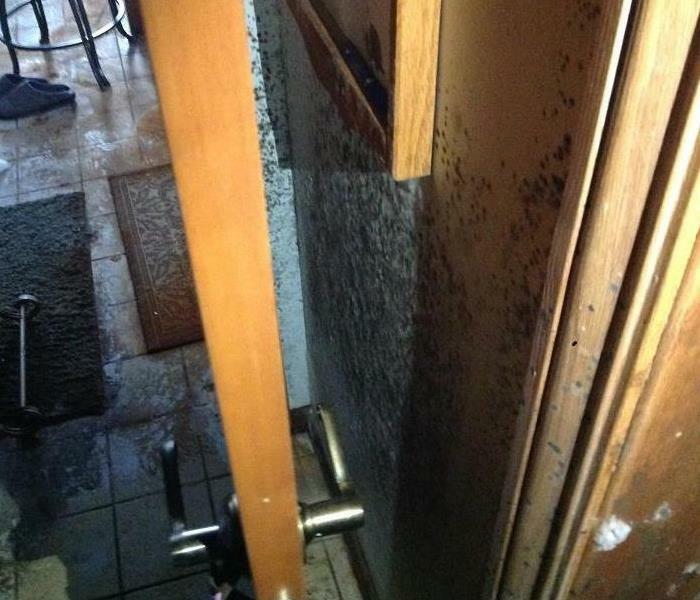 When water gets into places it doesn't belong it can leave behind an unwelcome visitor: mold. This photo shows just one example of the different kinds of mold that can result from unwanted water. SERVPRO of East Brown County is equipped to help with mold cleanup to ensure you and your family are breathing healthy air. Hoarding is a serious issue that affects people across the Green Bay area. 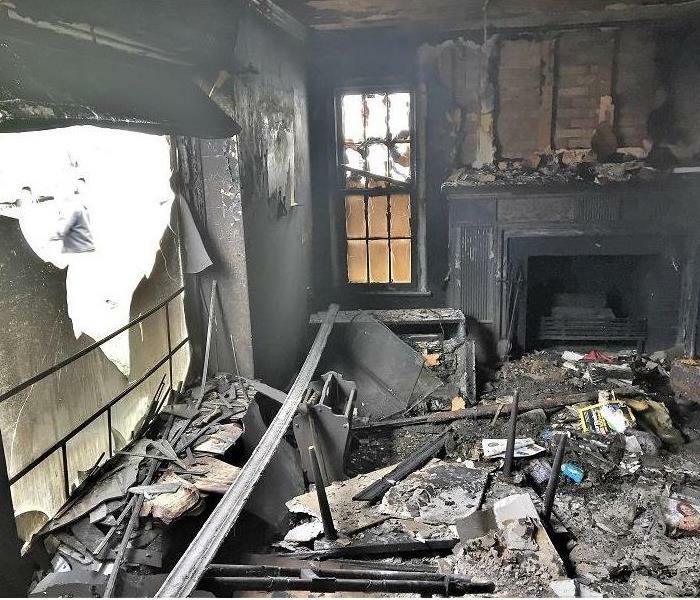 Aside from the intense impact on a person's mental health, hoarding can also pose dangers like risk of fire and even collapse. 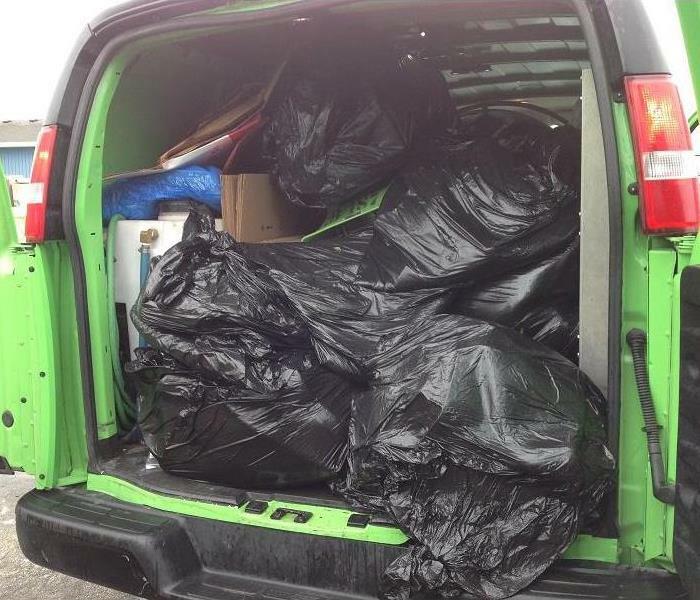 If needed, at SERVPRO of East Brown County, we are here to help with the cleanup and item removal. 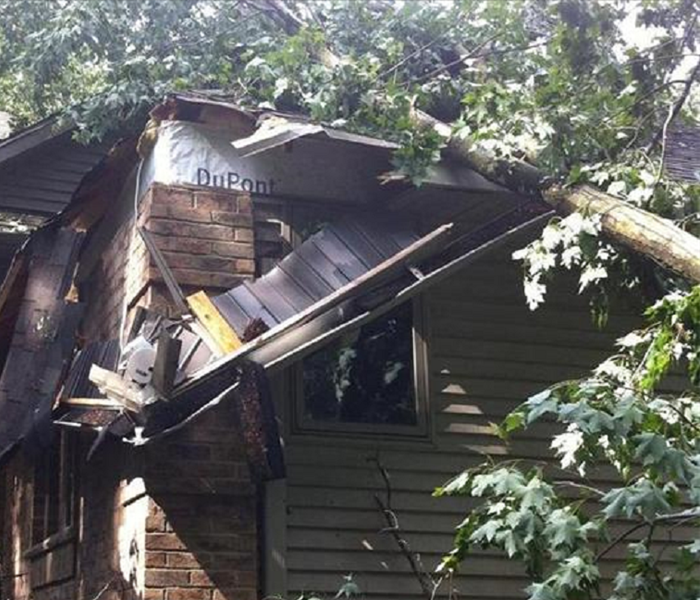 A tree fell on a Green Bay area home during a storm, damaging the roof. The SERVPRO team helped in the aftermath, removing debris and getting the home ready for reconstruction. When severe weather strikes, we are here for you. 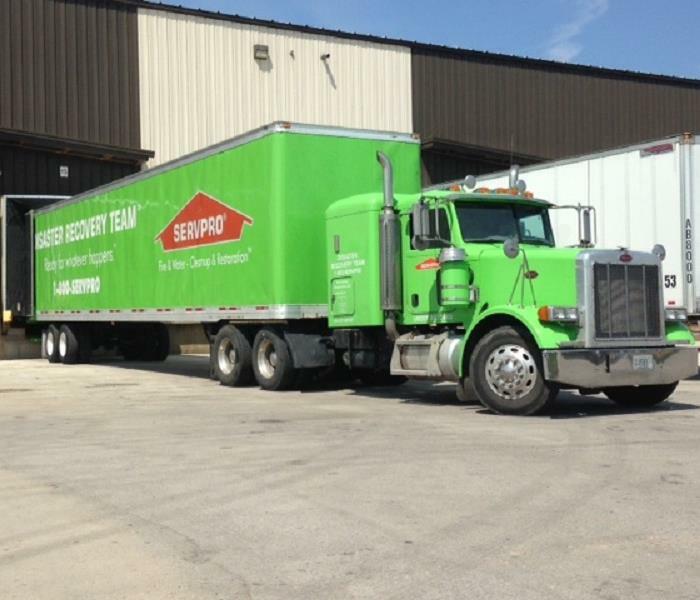 At SERVPRO of East Brown County we can help businesses with cleanup of all kinds. Whether it's some typical, spring cleaning, or something more intense after a fire or flood. We are here for you. 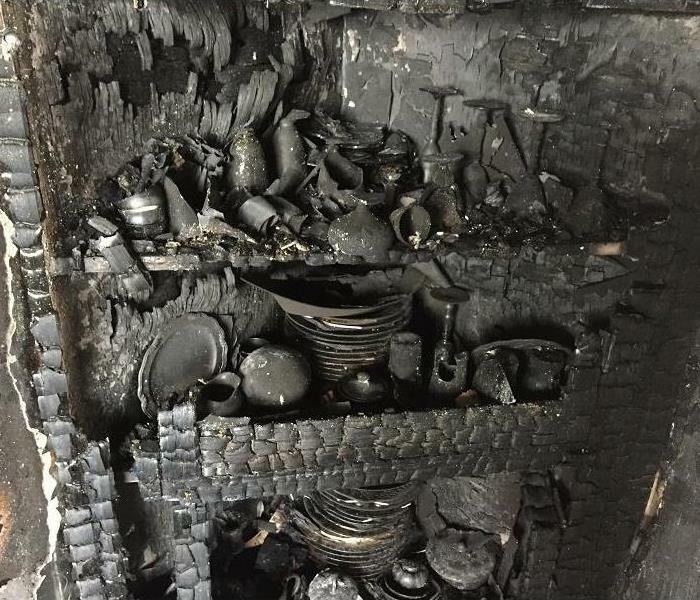 These burnt dishes show the aftermath of a major fire SERVPRO worked on in the Green Bay Area. The photo serves as a reminder of how devastating fires can be. We at SERVPRO are here for you should you need us to help after such a tragedy. At SERVPRO of East Brown County we deal with water damage of all kinds, in all seasons. This is a look at the outside of a house from winter 2018 that dealt with water damage. You can see how the water turned to ice outside. 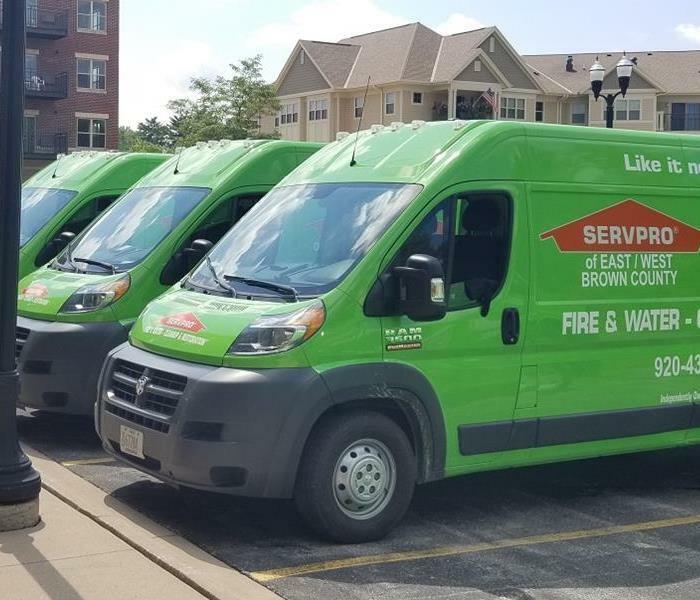 At SERVPRO of East Brown County we help clean up in the aftermath of fires of all sizes. This is was a major fire that happened in Green Bay. There was so much damage the owner debated whether to tear the house down or rebuild. They chose to rebuild and we did the entire job over several months. At SERVPRO of East Brown County we help clean up in the aftermath of fires of all sizes. This is from a stove fire in Seymour, Wisconsin from January 2018. Our Sales and Marketing Staff of Bill Kupsh and Jim Knopf joined forces with the Salvation army to ring the bell for donations to this worthy cause. 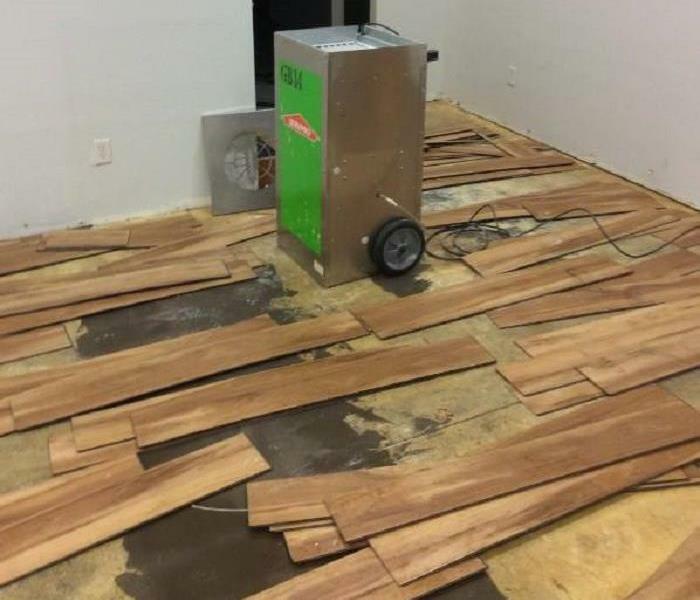 This is a great example of how our floor mat systems are used to remove moisture from hard wood flooring that sufferred water damage. The floor mats gently vaccuum the moisture out of the flooring, thereby saving the hardwood from cupping or warping. SERVPRO of East Brown County's Sales and Marketing Manager, Jim Knopf, takes home the top fundraising trophy of the night in Green Bay. 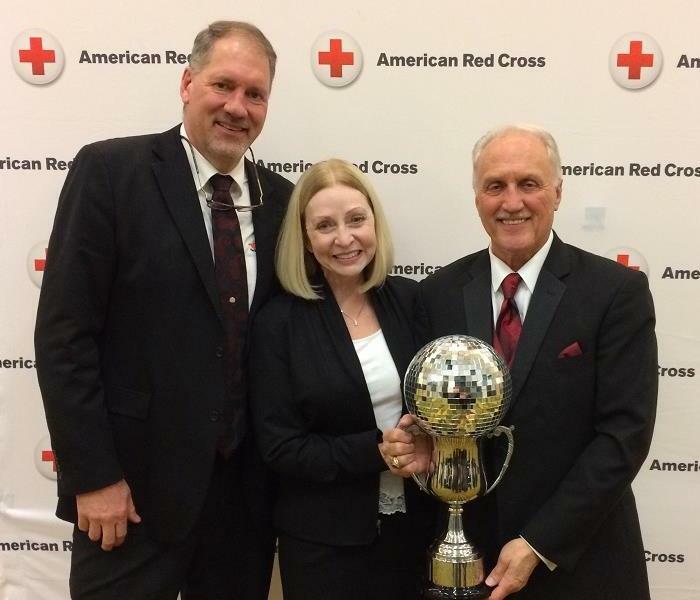 Jim was a dancer in the event and raised over $27,000 to benefit the American Red Cross. SERVPRO of East Brown County was proud to sponsor a table of ten at the event and be part of a great night for the Red Cross as over $206,000 was raised in total. 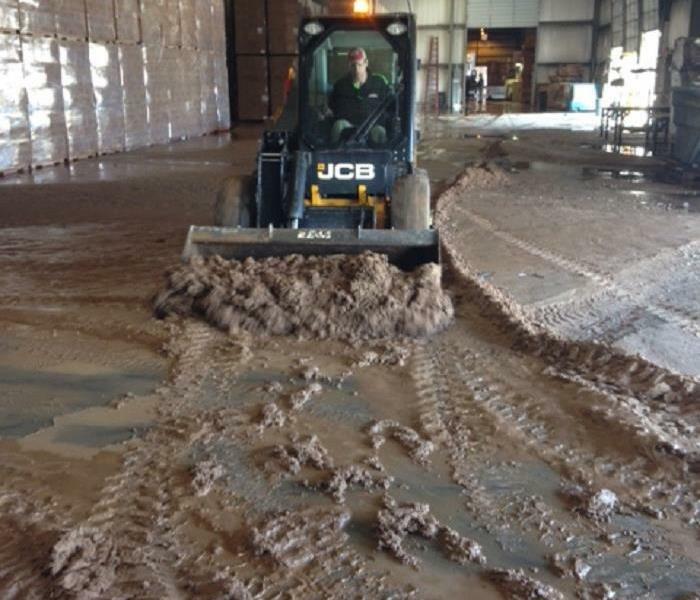 SERVPRO of East Brown County Removing mud at water main break flood of warehouse in Green Bay, WI. This job was at a local warehouse that had a water main break under their concrete floor. The result was thousands of high pressure gallons of water flowing up through a manhole cover and into the building. The water was mixed with tons of sand and dirt which caused a huge mess! SERVPRO of East and West Brown County was called in on a Saturday morning to handle the emergency clean up. Within an hour of getting the call we were on site and started the cleanup by bringing in a skidsteer to get six inches of accumulated sand and mud out of the building we could then start extracting water and cleaning up the building. By monday the majority of the emergency cleanup was complete and in less than a week we were completely done restoring the building and we were able to work around the buildings occupants to ensure they did not have any major disruptions to their normal operations. The results are in! 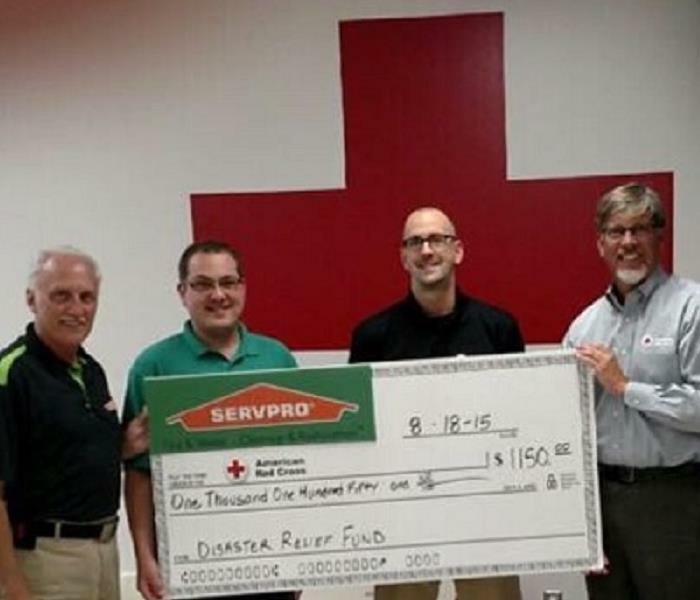 SERVPRO of East and West Brown County held an open house and Fundraiser for the American Red Cross earlier this month. In addition to celebating our new building and location, the goal was to support the American Red Cross with a fundraiser. $1,150 was raised and presented by our sales team of Jeremy Meyers and Jim Knopf to Steve Hansen, the chapter executive of the Wisconsin region. A special thanks to all our sponsors for helping make this event happen. We are happy to help the American Red Cross as our partner in emergency disaster relief. SERVPRO of East and West Brown County had a Ribbon Cutting Ceremony for our new building in conjuction with the Greater Green Bay and DePere Chambers on August 5th. We have moved into our new location at 2225 Pamperin Rd in the Howard Business Park. We have more than doubled our space as we moved into a beautiful 16,000 square foot facility. The facility is perfect for our needs and provides room to continue our growth in the restoration industry of Green Bay and the surrounding communities. We are now able to house all of our equipment and vehicles within one building which will lead to much improved efficiencies and just plain convienances that were not available to us before. SERVPRO of East / West Brown County recently hosted an all day CE event for the Restoration and Insurance Industry. Nearly 100 registered agents, adjusters, property managers and staff were treated to a continental breakfast and a full lunch as they learned the science and processes behind restoring contaminated buildings and drying wet structures. In addition, an ethics class rounded out the day. These CE classes are designed to give property managers and insurance agents a better knowledge base regarding emergncy water services and how to better help their custoers and properties. SERVPRO is pleased to be an industry leader in educating how we make sure customers are completely satisfied and have their homes and businesses returned to a "Like it never even happened" state. We thank our sponsors and partners Sherwin Williams, CRDN, and ERS for their support. 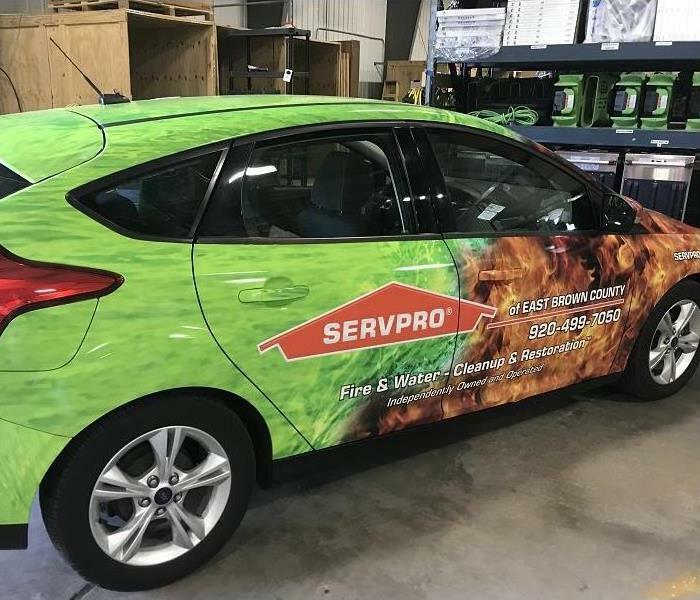 SERVPRO of East and West Brown County can handle the largest commercial building disasters in Green Bay and the surrounding communities. We have the equipment, resources and the expertise to carry out the mitigation and restoration of everything from residential to commercial. Are odors in your home or business getting out of control? Call SERVPRO of East and West Brown County to help eliminate them. 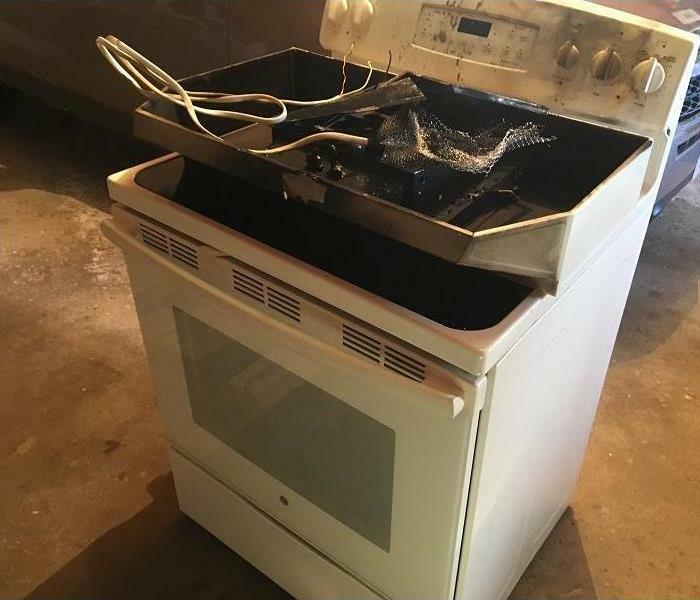 Wether they are from smoke, mold, mildew, or other things like animals, we can help with our expertise, equipment and proprietary deoderizers.